Plenty of home cooks are challenged by dessert. Luckily, for all of us who aren't master chef-level bakers, there's store-bought puff pastry. Thawed, frozen puff pastry can be your best friend in the kitchen, especially when you want to create delicious, impressive desserts (and also appetizers) that are easy and quick to assemble. We've collected our favorite dessert recipes using store-bought puff pastry that are perfect for enjoying at any meal, or as an afternoon pick-me-up with tea or coffee. They're also great when you're wondering what to bring to a dinner party or potluck, when you want to wow but don't have hours to devote to cooking. These beautiful little puff pastry heart sweet rolls can be served either as cookies for an afternoon pick-me-up, or as a sweet cinnamon-dusted roll for brunch. They're pretty enough for a special occasion such as Valentine's Day, or children's birthday dinners, but simple enough for an easy weekend treat, thanks to the use of the ready-made dough. Melt-in-your-mouth cherry turnovers are a welcome treat to enjoy at breakfast, brunch, lunch, or dinner. You can also serve them to kids after school, or with your afternoon coffee. They couldn't be any simpler to make! Just five ingredients, including store-bought puff pastry and canned cherry pie filling, is all it takes to create these scrumptious pastries that taste like they're made from scratch. Want to start your day with something sweet? This easy "breakfast dessert" recipe for Nutella pastry puffs takes only five ingredients and 20 minutes to make for weekend family breakfasts, but it's impressive enough that you can serve it for wowing guests at brunch. Scrumptious and irresistible oven-baked pastries filled with hazelnut-chocolate spread are super simple to make using store-bought puff pastry and will make your kitchen smell fantastic. Creamy and delicious, this apple tart recipe makes a nice change from the usual apple pie. Serve these beautiful looking fruit pastry desserts when you want to awe guests at special occasion dinners, dinner parties, and festive occasions all year round. Apples are tossed with lemon juice and sugar, scooped into individual tart pans lined with store-bought puff pastry, then covered with a whipped cream topping and baked in the oven. The result is a creamy apple tart for every guest that is sure to gain you kudos for your baking skills. Tarte Tatin tastes and looks super special, but it's way easier to prepare than you'd guess, with store-bought puff pastry dough. This inverted banana puff pastry tart recipe is a great dessert to make on short notice, and is a wonderful way to use up ripe bananas. Frozen puff pastry and sliced bananas combine with a homemade rum sauce, for an impressive upside down cake dessert. You can also use pre-made caramel sauce, in place of homemade sauce, for an even quicker preparation. Napoleons are a classic French pastry that you can find at just about every bakery in France. Decadent and impressive to serve, Napoleons (called mille-feuille in French) aren't difficult to make at home, especially if you use frozen puff pastry dough, as directed in this recipe. Rich custard pastry cream filling is sandwiched between crispy layers of puff pastry and glazed with a glossy royal icing. The end result is a wonderfully appealing blend of flavors and textures that's perfect for satisfying your sweet tooth at tea time or over coffee. Makes a wonderful dessert idea for a baby shower or bridal shower. 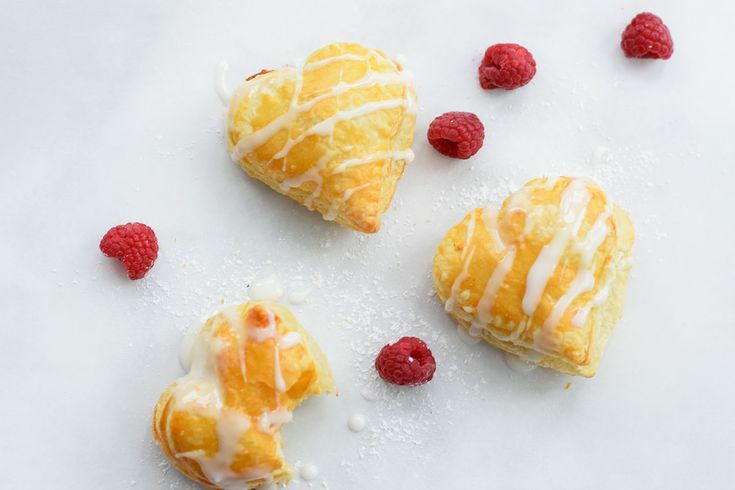 These delicious raspberry pastries are a perfect treat for a Valentine's Day breakfast, when you cut the pastry into adorable little hearts. Hot and flaky danishes filled with yummy raspberry filling are cooked in the oven until they're golden brown, then finished with a quick glaze. Only five ingredients, including store-bought puff pastry, is all it takes to create this romantic, sweet pastry treat. When you want to serve something homey and delicious for dessert, and you have some time to assemble it, look no further than this easy lattice pie recipe. Ready-made puff pastry is used as a pie shell and for the lattice top crust in this recipe, which also includes instructions for a rich, decadent Spanish pastry cream filling. The pastry shell is filled with your favorite berry medley, covered with a lattice of prepared puff pastry strips, then baked in the oven. It makes a wonderful treat at weekend brunch, dinner parties, and family gatherings. 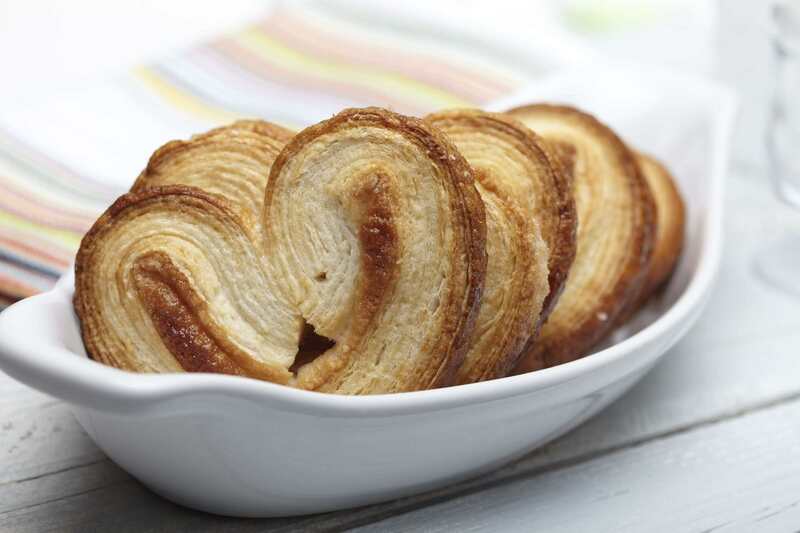 Miguelitos de la Roda are a light and flaky pastry with cream filling that's traditional to Spain. Dusted with powdered sugar for a beautiful finish, this yummy, creamy treat looks and tastes like it took hours to produce. Fortunately, it is simple to make and takes very little time or baking skills. Just roll, cut, and bake ready-made puff pastry sheets, follow the instructions for a simple pastry cream to spoon into the center, then bake, dust with sugar, and enjoy. Here's a dessert that's fit for a Pope, and easy to recreate at home! Polish cream cake is a beloved dessert from Poland that's similar to the popular French Napoleon dessert. The Polish version was renamed Papal Cream Cake when it was learned that none other than St. Pope John Paul II loved it. You can recreate this special dessert easily at home with store-bought puff pastry. Prepared pastry is baked quickly, filled with easy-to-make pastry cream, and refrigerated to set, before being cut into squares and dusted with powdered sugar for a pretty presentation. Want to celebrate someone special, or need a crown-themed dessert for an Epiphany feast? Here's a traditional French cake recipe that's sure to please family and friends. Galette des Rois (King Cake) is a beloved French dessert that layers homemade almond cream filling between delicate, buttery layers of puff pastry. This recipe gives instructions for using thawed, frozen puff pastry, and a recipe for simple almond cream that's made in a food processor, to make this dessert far easier to prepare than it looks. Who doesn't love fresh-from-the-oven fruit turnovers? This mango turnover recipe produces a flaky, sweet, delicious warm dessert that's ready in 30 minutes. These yummy pastries can be served as an after-dinner treat, as an afternoon snack with coffee, or enjoyed for breakfast. Use pre-made frozen pastry to make the preparation super simple. Beautiful little round pastry tarts filled with rich tasting pastry cream is a dessert made in heaven. Thankfully, this attractive and comforting dessert that hails from Serbia is also pretty easy to put together, especially when you use pre-made dough. Sheets of thawed, frozen puff pastry dough are sectioned off and baked until they're golden and crispy. Then they're layered with pastry cream and refrigerated the dessert is set. This is a great make-ahead dessert for family gatherings, special dinners and festive holiday meals. Danish pastries are a favorite dessert at weekend brunch, and a wonderful way to finish a late morning meal. This delicious recipe for cute little blueberry danish pastries includes cream cheese and vanilla for a creamy, rich, fruity taste in every bite. Ready-made puff pastry makes the preparation super simple, and these little pastry bundles are pretty enough to impress guests at brunch, baby showers and bridal showers, or Easter lunch. Nobody has to know how easy they were to make. A gorgeous pastry braid makes a fabulous impression on your table, making it the perfect thing to serve at all your holiday breakfasts and brunches, or when you want to treat overnight guests. Cherry pie filling and refrigerated crescent roll dough make this recipe extremely super easy to pull together, but we won't tell if you won't! Fragrant toasted almonds add a special flavor that takes this breakfast dessert to the next level. Your guests will ooh and ahh over this gorgeous treat that looks beautiful served whole or sliced.